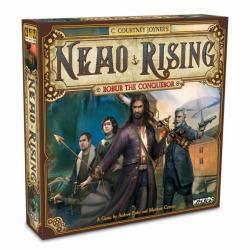 Courtney Joyner’s adventure novel Nemo Rising is being converted to a board game by WizKids, which will release Nemo Rising: Robur the Conqueror in September. Nemo Rising: Robur the Conquerer is based on Joyner’s novel, published in 2017, that picks up the adventures of the famous Captain Nemo and the crew of his submersible Nautilus where Jules Verne’s classic 20,000 Leagues Under the Sea leaves off. In this cooperative game, the players take on the role of characters from the book, choosing from Nemo himself, Sara Duncan, Adam Fulmer, or Ulysses S. Grant. The players must work together to overcome challenges using their characters’ abilities, special action cards, and custom dice. The game includes two separate scenarios. In the “Undersea Grotto,” the heroes must confront sea life and a mechanical kraken as they collect supplies on the bottom of the sea. In “City in the Sky,” they confront the villain Robur and his army of steam-powered constructs and soldiers. Nemo Rising: Robur the Conquerer was created by Andrew Parks (Core Worlds, Canterbury) and Matthew Cattron. It is intended for 1 to 4 players, ages 14 and up, and takes about an hour-and-a-half to play.